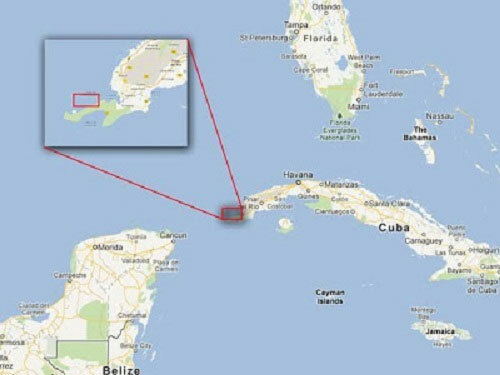 The discovery was first made in 2001 when Pauline Zalitzki, a marine engineer, and her husband Paul Weinzweig, owners of a Canadian company called Advanced Digital Communications (ADC), were working on a survey mission in conjunction with the Cuban government off the tip of the Guanahacabibes Peninsula in the Pinar del Río Province of Cuba. ADC was one of four firms working in a joint venture with President Fidel Castro's government to explore Cuban waters, which hold hundreds of treasure-laden ships from the Spanish colonial era. The team was using advanced sonar equipment to scan a 2 square kilometre area of the sea floor when they noticed a series of symmetrical and geometric stone structures resembling an urban complex. Map showing location of supposed ancient city discovered by Paul Weinzweig and Pauline Zalitzki. Image source. In July 2001, they returned to the site with geologist Manuel Iturralde, senior researcher of Cuba's Natural History Museum, this time equipped with a Remotely Operated Vehicle to examine and film the structures. The images revealed large blocks of stone resembling hewn granite, measuring about 8 feet by 10 feet. Some blocks appeared deliberately stacked atop one another, others appeared isolated from the rest. Zalitzki said that the images appeared to reflect the ruins of a submerged city but was reluctant to draw any conclusions without further evidence. Estimating that it would have taken 50,000 years for such structures to have sunken to the depth at which they were said to be found, Iturralde added "50,000 years ago there wasn't the architectural capacity in any of the cultures we know of to build complex buildings." A specialist in underwater archaeology at Florida State University added "It would be cool if they were right, but it would be real advanced for anything we would see in the New World for that time frame. The structures are out of time and out of place." In the media storm that followed the announcement of the discovery, news sites were quick to draw parallels with the fabled lost city of Atlantis. However, Zelitsky and Weinzweig were unwilling to make such comparisons. The story is myth, said Zelitsky. "What we have found is more likely remnants of a local culture," once located on a 100-mile "land bridge" that joined Mexico's Yucatan Peninsula with Cuba. Iturralde added that there are local legends of the Maya and native Yucatecos that tell of an island inhabited by their ancestors that vanished beneath the waves. Nevertheless, Iturralde does not discount the possibility that the rock formations are merely the result of the wonders of Mother Nature. “Nature is able to create some really unimaginable structures,” he said. Featured image: Reconstructed Image taken from the sonar scan of the sea floor off the coast of Cuba. Bauza, Vanessa (Oct 27, 2002). "Submerged Cuban Ruins May Be Manmade, Experts Say". Daily News, Bowling Green, Kentucky. Retrieved 3 October 2012. Handwerk, Brian., New Underwater Finds Raise Questions About Flood Myths, National Geographic News, May 28, 2002. 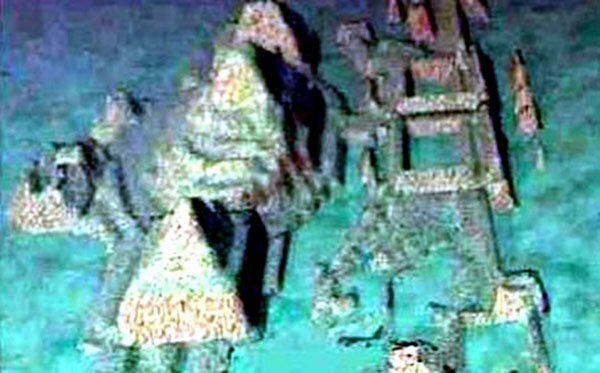 Lost city' found beneath Cuban waters, BBC News, 7 December 2001. It doesn't fit into mainstream archeology, so therefore there in no big money in looking into it, just like the Egyptian artifacts found in the USA. This underwater city has to be very old, far more than 50,000 years. Cuba, it the extreme ancient past was in the Pacific Ocean. The three pyramids seem to be closer together than in Giza. We suggest an examination of the position of the Orion belt in the ancient past to confirm the date. We can not do this because we do not have access to more accurate data on both the sunken city and the ancient location of the stars in Orion. We think, however, that the date may be millions of years old. We have confirmed a date of just under 66 million years for the cities of Tulum and Chechen Itza in the Yucatan in Mexico. Who is this "we" you speak of? Just curious because Tulum is less than a thousand years old being occupied only as early as 1200 AD and Chechen Itza is less than 2000 years old being first occupied around 600 AD. 66 million years old, really? Although I agree that 66 million years does seem a bit extreme, I just can't believe that Chichen Itza is less than 2000 years old. I recently visited and was shocked to hear from our guide that it wasn't considered to be older. Apparently Chichen Itza began to flourish and gained importance in the region around 600 AD, so my guess is that it was constructed many many years before that. The same goes for the pyramids and sphinx in Egypt, these monuments are so much older than anyone would like to admit. I just don't get why this information is being deliberately held from us? There is obviously a damaging truth to the system that's being hidden from us mere mortals.